Yoga workshops are an excellent way to compliment and inspire your regular yoga and meditation practice. The opportunity to focus on specific practices and/or postures and have plenty of time to ask questions, make workshops the perfect environment to take your practice to the next level. For more information on any event, please contact me. Stretch, Relax and Resolve: A Workshop to Sweep Away Cobwebs and Set Intentions for the Year Ahead. This yoga workshop will focus on deep stretches to release tension in the body, meditation techniques (including chanting) to release tension in the mind and will end with a long relaxation known as yoga nidra. Yoga nidra is a deep relaxation which can bring an incredible calmness, quietness and clarity. Yoga nidra can allow us to connect to our unconscious mind and during the relaxation we traditionally use this connection to make a resolve, known as a sankalpa. Practices in this workshop will include, moving, sitting and lying meditation/relaxation. Spaces are limited and booking is essential with payment in advance to ensure your space. If you book a place and then for some reason are unable to attend, if I am able to fill the space I will refund you. NB – The workshop is open to everyone apart from complete beginners, as some knowledge of yoga will be assumed. In Abruzzo Italy, a chance to take some time for yourself and immerse yourself in your yoga practice. If you are interested in any of the previous events, please let me know, as if there is enough interest I can repeat an event. As the leaves get crunchier, the mornings get crisper and the layers get snugglier, we can feel that Autumn is here. On this last Sunday in October when the clocks have gone back, come and join us for a 2 hour yoga and meditation practice followed by a 1 hour Gong Bath by Ellie Hunter. In this workshop we will honour the change in season and work with practices to help ease the transition. I will teach posture, breath and meditation techniques to help us to feel more grounded and we will then spend an hour being bathed in sound, the perfect way to cleanse the mind and body ready for the season ahead. – This yoga workshop will focus on asana, pranayama and meditation practices to help us to feel more grounded and will end with a long lying relaxation where we experience the cleansing and grounding vibrations of the Gong Bath. – We will practise a range of methods to enable students to find techniques that work for them. – Practises in this workshop will include, moving, sitting and lying meditation/relaxation. The Venue – Casa Mayor is a stunning centre just 35 minutes from Malaga airport set in 63 acres of land with beautiful walking and a lovely swimming pool. But most importantly a wonderful fully equipped yoga studio and practice terrace with amazing views. Working towards headstand – a yoga and meditation workshop. Saturday, March 24, 2018 at 10 AM – 12:30 PM, £25. In this morning workshop we will explore working towards the yoga posture Salamba Sirsasana (Supported Headstand) – otherwise known as Yoga Headstand. The workshop will cover warm up and preparatory postures and techniques to allow students to develop the strength and coordination required for this inversion posture. Once the body is warm and the body and mind prepared we will explore the posture in depth, including modifications and props that will allow everyone, including those who don’t want to weight bear through the neck, to go up into headstand or a variation of headstand. There will also be time for supporting pranayama (breathing techniques) and meditation and of course Savasana to close the practise. Yoga & Meditation workshop Saturday, 3rd June, 2017, 10am-1pm. £25 – at The Howard Venue. – This yoga workshop will focus on meditation and relaxation techniques and will end with a long lying relaxation. The workshop will include physical and mental practises and techniques to help students to slow down, focus inward and reconnect with their authentic selves. – We will practise a range of methods to enable students to find techniques that work for them. Methods will focus of those that foster not only relaxation and sleep but that also develop a sense of connection that can lead us to feel generally happier. This yoga workshop will focus on the yoga concept of Spanda – Spanda can be translated as throb or pulse or vibration/wave like motion. When we tune into the pulsation inside our bodies, we are connecting to our own inner aliveness. In our general yoga practice it’s useful to be able to feel the pulsation in our body so that our postures can feel free-er and more alive. Using external sounds can be a more dramatic way of feeling vibrations through the body, bringing feelings of renewed energy. The first part of the workshop will focus on physical practises that help us to connect to the subtle vibration of the body and the second part of the workshop will be a gong bath, given by Ellie Costa. Ellie will play the gongs which will send vibrations through our bodies. As everything is vibrating so are we. Sometimes we can become out of tune in either mind, body or spirit and dis-ease can start to take hold. Through the healing frequencies of sound therapy our bodies can be brought back in tune and we can begin to feel healthy and balanced once more. This yoga workshop will focus on meditation and relaxation techniques, including the use of sound and will end with a long lying relaxation. The workshop will include physical and mental practises and techniques to help students to slow down, focus inward and reconnect with their authentic selves. We will practise a range of methods to enable students to find techniques that work for them. Methods will focus of those that foster not only relaxation and sleep but that also develop a sense of connection that can lead us to feel generally happier. This morning workshop will begin with a physical practise focussing on strengthening and mobilising the hips and shoulders to open the hips and the heart centre in preparation for meditation. Following the physical practice we will sit for pranayama ( breath work ), meditation and end with Savasana (lying relaxation). This yoga workshop will focus on meditation and relaxation techniques, including the practise of gratitude and will end with a long lying relaxation. The workshop will include physical and mental practises and techniques to help students to slow down, focus inward and reconnect with their authentic selves. Very similar to last months workshop, but with a few changes based on the feedback I have had, this morning workshop will use physical practise, focussing on strengthening and mobilising the hips and shoulders to open the hips and the heart centre in preparation for meditation. Intermingled with the physical practise we will sit for pranayama (breath work), meditation and end with Savasana (lying relaxation). This morning workshop will begin with a physical practise focussing on strengthening and mobilising the hips and shoulders to open the hips and the heart centre in preparation for meditation. Following the physical practise we will sit for pranayama ( breath work ), meditation and end with Savasana (lying relaxation). I am very excited about the next yoga and meditation workshop, which will be taught by my teacher and mentor, Anna Ashby. The workshop is open to everyone, including beginners. If you are a yoga teacher, then attending this workshop could count towards your CPD. If you are thinking about becoming a yoga teacher, then this would be a great opportunity to meet Anna as the founder and senior teacher of Triyoga’s teacher training program. The workshop will explore yoga practice as a way of living a more balanced and fulfilling life. Addressing the nature of effective practice, and how practice can offer tangible support both on and off the mat, the workshop will provide the space to shift perception around time, approach and practice. In this morning workshop we will explore the yoga postures Adho Mukha Vrksasana (Downward Facing Tree Pose) and Salamba Sirsasana (Supported Head Pose) – otherwise knows as Handstand and Headstand. The workshop will cover warm up and preparatory postures and techniques to allow students to develop the strength and coordination required for these inversion postures. Once the body is warm and the body and mind prepared we will explore the postures in depth, including modifications and props that will allow everyone, including those who don’t want to weight bear through the neck, to go up into handstand and headstand or a variation of headstand. There will also be time for supporting pranayama (breathing techniques) and meditation and of course Savasana to close the practise. NB/ The workshop is open to everyone apart from complete beginners, as some knowledge of yoga will be assumed. The content has not been modified for pregnancy or contraindicated conditions that are not under control via medication, for eg high blood pressure. If you are not sure if this workshop is suitable for you and would like more details, please contact me. Stretch, Relax and Resolve: A Yoga Workshop to Sweep the Cobwebs Away. 24th January 2015, 10am to 1pm ***FULLY BOOKED. This yoga workshop will include physical and mental practises and techniques to help students to slow down, focus inward and reconnect with their authentic selves. We will practise a range of methods to enable students to find ways of working to help them-selves, relax, sleep and develop a sense of connection. Practises will include, moving, sitting and lying meditation/relaxation. In this morning workshop we will explore calming yoga inversion postures including Salamba Sarvangasana (Supported All Limb Pose – otherwise known as yoga shoulder stand), Halasana (Plough Pose) and Karna Pidasana (Ear Pressure Pose – otherwise known as knee to ear pose). The workshop will cover warm up and preparatory postures and techniques to allow stu-dents to develop the strength and coordination required for these inversion postures, so that once in the postures the full calming benefits can be felt. We will explore the postures in depth, including modifications and props that will allow everyone to practise some form of the poses. There will also be time for supporting pranayama (breathing techniques) and meditation and of course Savasana to close the practise. In this morning workshop we will explore the yoga posture Salamba Sirsasana (Supported Headstand) – otherwise known as Yoga Headstand. The workshop will cover warm up and preparatory postures and techniques to allow stu-dents to develop the strength and coordination required for this inversion posture. Once the body is warm and the body and mind prepared we will explore the posture in depth, including modifications and props that will allow everyone, including those who don’t want to weight bear through the neck, to go up into headstand or a variation of headstand. There will also be time for supporting pranayama (breathing techniques) and meditation and of course Savasana to close the practise. In this morning workshop we will explore the yoga postures Adho Mukha Vrksasana (Downward Facing Tree Pose) and Pincha Mayurasana (Feathered Peacock Pose) – otherwise knows as Handstand and Forearm Balance. The workshop will cover warm up and preparatory postures and techniques to allow students to develop the strength and coordination required for the two inversion postures. Practice is key and the long morning session will mean plenty of time for enjoying the benefits of these invigorating postures. There will also be time for supporting pranayama (breathing techniques) and meditation and of course Savasana to close the practice. Following the success of the Yogathon in June 2010 in Sidcup Kent, led by BWY teacher Brian Hately, to raise money for OBJECT, Chingford based BWY teacher Mohini Chatlani and Sidcup BWY teacher Clair Yates teamed up to lead a new group of brave yogis in another round of 108 Salutations to the Sun, this time in Chingford, to raise money for OBJECT. 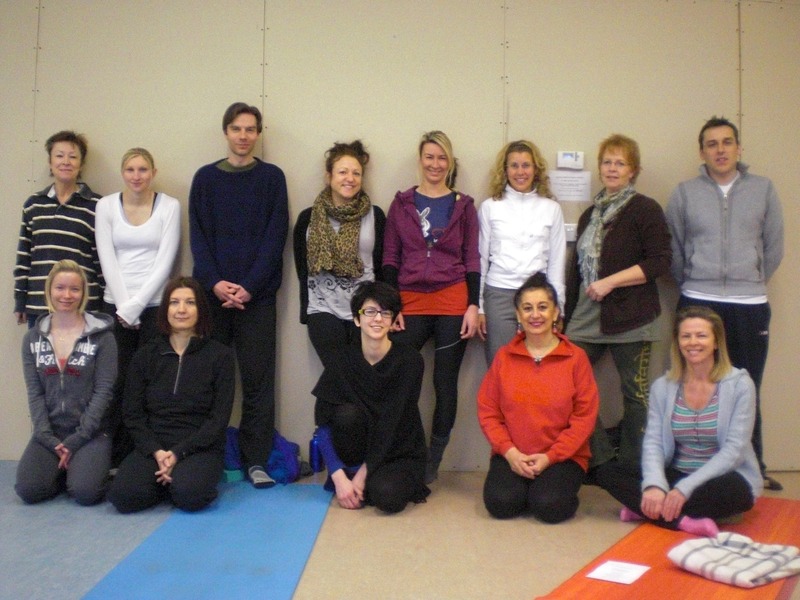 16 yogis took part in the Salutations on the 29th January 2011, donating £10 each and some also raised sponsorship. This means that a fantastic £310 has been raised so far and there are promises of more sponsorship so the total could be even higher. The British Wheel of Yoga generously donated yoga goody bags as a thank you to everyone who took part. Mohini’s moving words made the connection between yoga as a tool to help us move away from seeing ourselves as objects and raising money for OBJECT ‘s vital campaigns to challenge objectification in society. A big thank you to everyone who took part and supported us.